Willis Towers Watson is one of the oldest names in marine insurance having commenced as a marine broker in 1828 and remains at the forefront of the marine industry today. 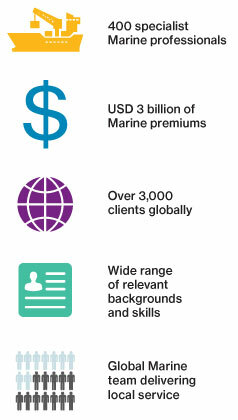 Our Global Marine practice group of some 400 professionals operates out of 17 specialist hubs across Europe, North America, Middle East and Asia and handles over USD 3 billion of premium annually. Areas of expertise include the traditional marine lines of Hull and Machinery, Protection and Indemnity, Special Risks (Liabilities), Superyacht and Cargo insurance. Our greatest speciality is in bespoke solutions for complex risks requiring global solutions with local services. Our teams are structured to provide highly personalised service while providing world class solutions to the many challenges of marine risk management. This integrated approach is backed by decades of knowledge allowing us to offer global expertise through a single point of contact at a local level no matter where your marine risk may be.